In college basketball, a losing season can get a coach fired. Players will often transfer amidst uncertainty. Fans will boo. Or worse yet: they won’t show up. In the NBA, losing seasons are viewed through a different lens. Fans sometimes cheer at the prospects of taking L’s in bunches. Coaches may lose their jobs, sure, but for a noble cause known as tanking, where teams, well, tank their season in order to get a better draft pick. It’s why the Knicks‘ single-greatest accomplishment as a franchise all season — and maybe the last five years — was probably its 18-game losing streak. Never mind that a team stinks during a shameless tank job; the stench of a rotten squad is worth it for some fans who know that at the end of the tunnel lies a high draft pick. Maybe Ja Morant. Maybe RJ Barrett. If you were really bad (looking at you, Knicks, Cavs and Suns! ), perhaps you’ll even be in position to draft Zion Williamson, Duke’s stellar freshman prospect who is expected to go No. 1 overall. Talk about a kind reward for being awful! The NBA has tried to curb tanking with new rules that are in place this year. The team with the worst record this season will pick no lower than fifth this summer, replacing the previous position of fourth. As a way to ensure the worst team isn’t guaranteed the best pick, the three teams with the worst records (as opposed to the one team with the worst record in the previous system) will be given a 14 percent chance to win the lottery. The previous structure of the weighted lottery system provided a 25 percent chance for the team with the worst record to win the top pick, the team with the second-worst record a 19.9 percent chance and the team with the third-worst record a 15.6 percent chance. We’ll find out the official order of the lottery on May 14, when the draft lottery will take place and the ping pong balls will, quite literally, decide the fate of the 14 teams included in it. As for the Bucks: Sorry. You were too good this season. As a result of your dominance, you will be picking last in this year’s first round. 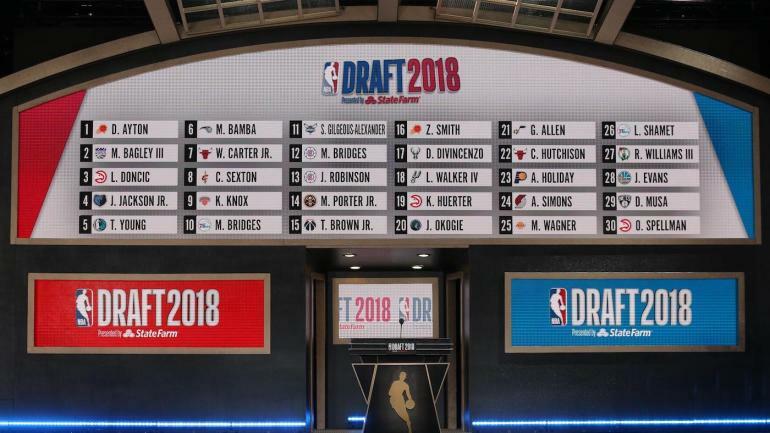 So with the NBA’s regular season officially coming to a close on Wednesday night, below is an updated look at the projected order of the 2019 NBA Draft.